Since Fabric joined forces with the Firebase team, our collective mission has been to bring the best of our amazing platforms together. 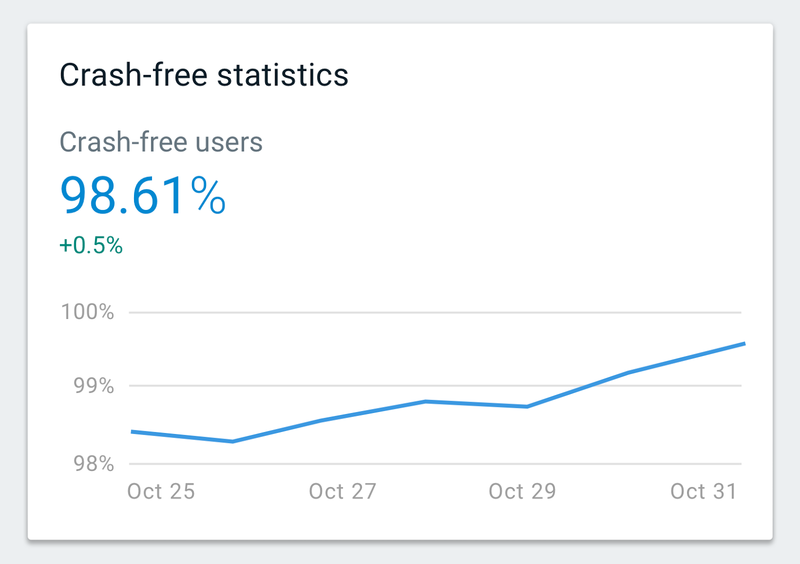 Today, we are pleased to announce a major milestone in that mission with the beta launch of Firebase Crashlytics. 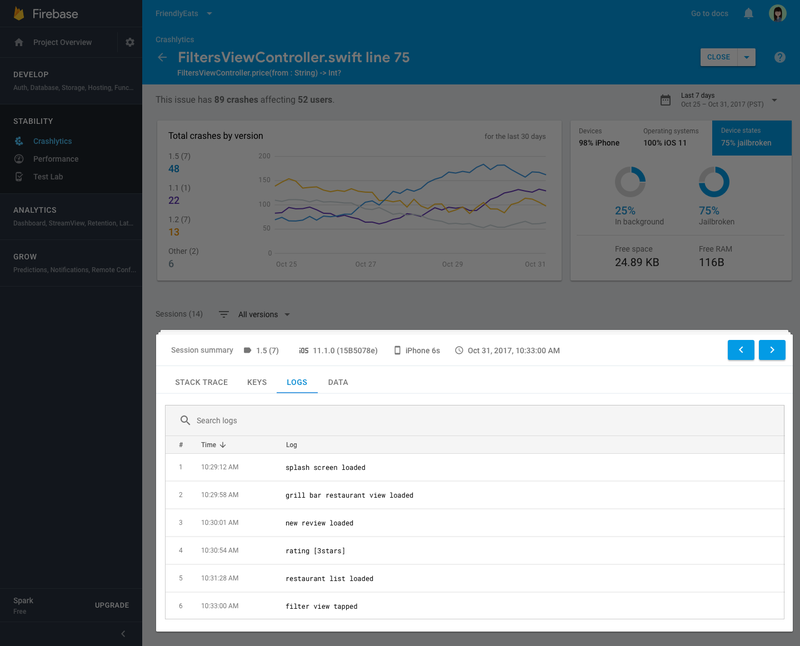 Firebase Crashlytics is a powerful, realtime crash reporting tool that will help you track, prioritize, and fix stability issues that erode your app quality. With this launch, Firebase developers can now access the best-in-class crash reporting solution right alongside all the other Firebase products you know and love in one unified console. From this point onwards, Crashlytics will be the primary crash reporter for Firebase, so if you're already using Firebase Crash Reporting, we recommend you upgrade now by clicking on the banner in your Crash Reporting dashboard. New Firebase developers can also start using Crashlytics by first installing Firebase and then clicking on Crashlytics in the left-hand navigation bar. Here's what you'll get when you upgrade. These benefits and features make Crashlytics a must-have tool for all mobile app developers. 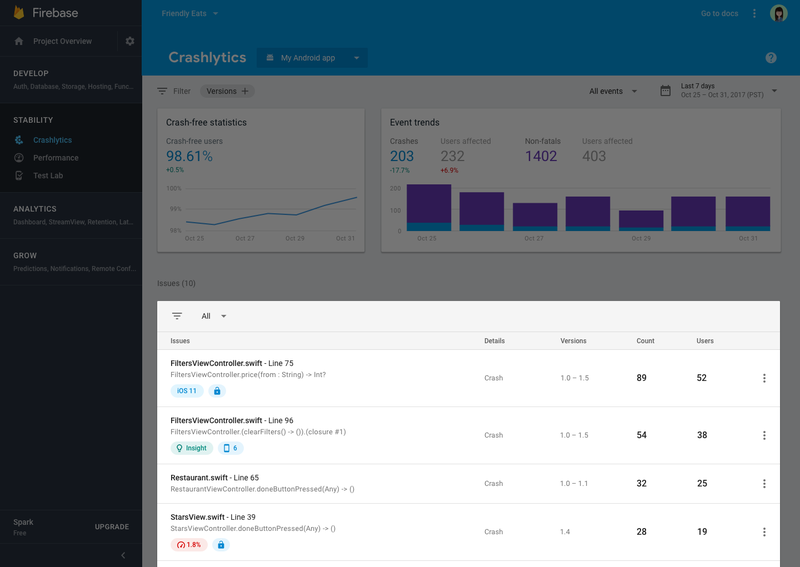 Crashlytics brings the most critical information regarding your stability to the forefront by grouping crashes based on similarity of stack trace and highlighting their impact. You can easily spot trends with the realtime crash data or, use version filtering to focus in on the specific releases you care about most. We designed the issue overview and the issue detail pages with the end-goal of reducing the time it takes to resolve issues. On the overview page, your crash-free user rate is prominently displayed so you can gauge which builds are improving in stability. You'll also notice significance badges. When highlighted, these badges indicate that important information is available for that issue that makes it unusual or stand out from the rest. For example, significance badges will tell you if certain issues only occur on a specific device, OS, or only on jailbroken phones. Armed with this insight, you can effectively triage issues at a glance and quickly react to urgent problems. Perhaps you'll choose to ignore issues that are only prevalent on jailbroken devices. Maybe you'll choose to first focus on fixing problems that arose because of the latest OS release. Significance badges will help you make smarter decisions with your troubleshooting time. 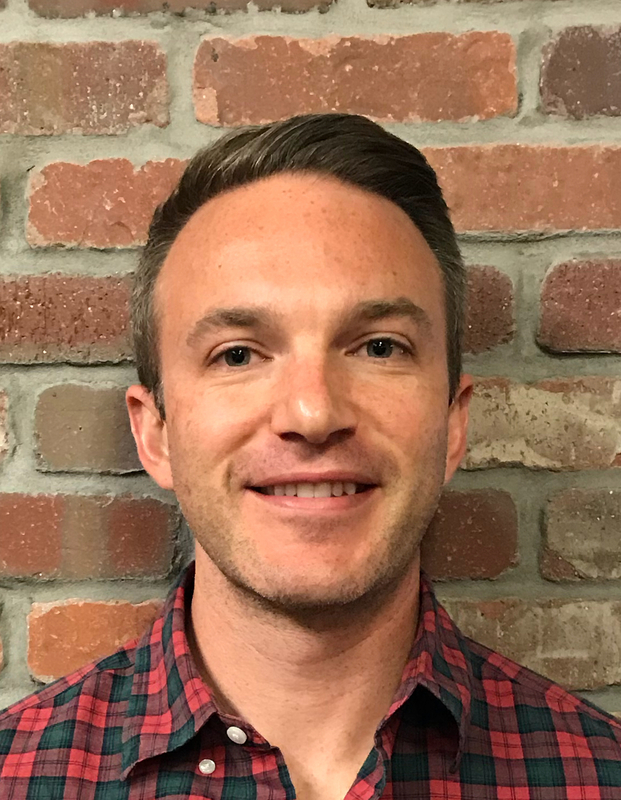 Crashlytics lets you instrument logs and keys, which provide additional information and context on why a crash occurred and what happened leading up to it. Specifically, you can use logs to gather details on what users were doing right before they encountered a crash (ex. user went to download screen, clicked on download button). You can also use logs to get details on users' actions (ex. image download size). Logs show you a timeline of events that preceded a crash. When a crash occurs, we take the contents of the log and attach it to the crash to help you debug faster. In some situations, knowing the last state of the user's app is just as important as the order of operations. Keys are key value pairs that record the last known value of something, because they get overwritten as a user navigates through your app. For instance, you can use keys to track the last level a user competed in your gaming app, or the most recent configuration of their custom settings - anything that may be indicative of context that might be relevant for debugging. Logs and keys are great ways to find clues in the session metadata and retrace your users' steps to reproduce the bug. Stability issues can pop up anytime - even when you're away from your workstation. Not only will new issues appear and be prioritized in realtime in your Crashlytics dashboard, but we'll also send you email notifications when new issues arise, if issues regress, and if issues suddenly increase in impact. That way, you can grab a coffee and step away with the peace of mind that we've got your back. Crashlytics will alert you if anything goes awry with your recently shipped app, so you never miss a critical crash. In addition to bringing many powerful Crashlytics features into Firebase, we've also gone one step further by starting to integrate Crashlytics with other parts of the platform. 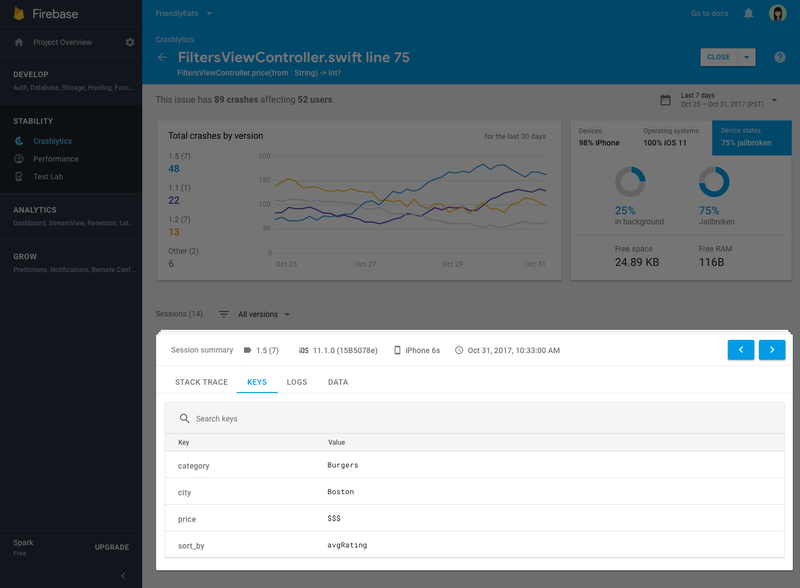 Now, you can use Crashlytics data as an event source to trigger Cloud Functions for Firebase to streamline and customize your troubleshooting process. With this integration, you can automate a workflow that routes issues impacting critical app flows (such as your purchase flow) directly to engineers on your team, or to a Slack channel. This way, you can ensure that urgent issues are monitored and escalated properly and promptly. We're also funneling stability data into various parts of the redesigned Firebase console, so you don't have to dig between different pages to stay on top of stability. Crashlytics data is now visible on your project overview page, Google Analytics for Firebase dashboard, and of course, the latest release section. 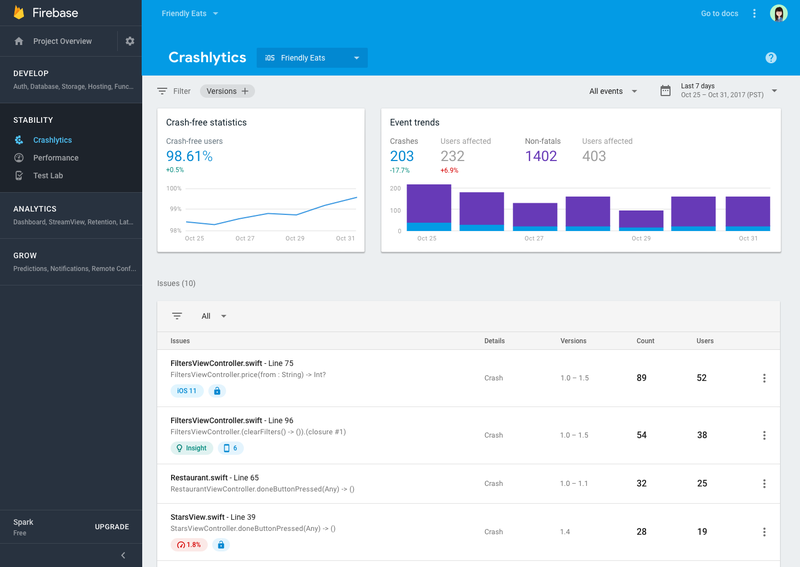 This beta launch of Crashlytics is just the beginning of combining the best of Fabric and Firebase. Customers have already started using our platforms together to achieve amazing results. Take Doodle, an app that helps people find the best date and time to meet, as an example. Doodle used Crashlytics and Remote Config to redesign their app and increase retention and engagement. New Firebase customers can get started with Crashlytics by installing Firebase and clicking on Crashlytics in the left-hand navigation bar, while existing Crash Reporting customers can click on the banner in their dashboard. We'll continue to build out Crashlytics and can't wait to hear your feedback! If you're already using Crashlytics on Fabric, you're all set for now - no need to migrate yet. We'll share exciting news soon about how your Fabric apps can take advantage of Firebase Crashlytics.